A standout release in any flow of good music that will capture your attention the way an attractive person in a room would. As you spend time with this person, attraction blossoms into a crush. 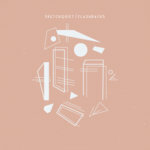 Sketchquiet is the object of affection here and Flashbacks takes you through serene ambient, moody IDM, longing-infused melodic-electronic and dream soaked drone. Opens with "Appreciating through the Window", a slow pensive melody gradually builds into a growing sense of optimism that gradually overwhelms the piece. "Waves from a distance" follows with cinematic tension with periodic bass notes that build into emotional intensity while the following "Chinese Noodles/Candle Light" is a split personality whose first half is catchy electronic that detours midway through into slow, brooding melodic ambient. "Dream Catcher" is a gem of a melodic IDM that kaleidoscopes sunshine moods along to a grooving shuffle beat. "My Only Affair" is a beautiful, immerssive continuous journey infused with a touch of longing that is also bittersweet, yet more the latter than the former. Ambient gives way to field recording fragments, moments of life spill in and dissolve into melifluous fragments of piano notes and the ticks of a distant clock. "I was never there" caps this release with a point/counter-point of moods-slow melancholic tones countered with energetic electronics which compliment one another into a rather emotionally nuanced piece. Flashbacks will haunt you in a good way, invoke repeated listens and seduce you into continuous quality time.